Through the dedicated efforts of our Pastor, Rev. 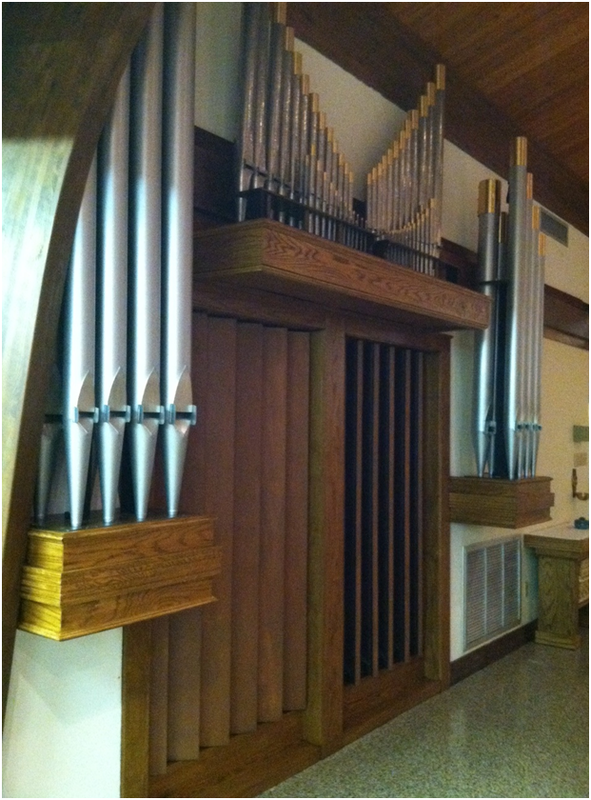 Stephen K . Kenny, our Director of Liturgical Music, Pat Monz, and numerous parishioners, our long term dream of enhancing our Music Ministry with the installation of a pipe organ was finally realized in 2016. After locating this unused instrument in Birmingham, a group of our parishioners accomplished the tedious process of carefully removing the instrument from the Forestdale Baptist Church and transporting all of the hundreds of individual parts to Somerville, where they were all temporarily stored at the rectory. Thomas Helms, Jr. was engaged as the organ builder who would be responsible for modifying the instrument to fit our needs and installing it in its new home. A construction project was then begun to modify the Sanctuary and adjacent office space to accommodate our new organ and improve the acoustics as needed for the new organ. Once the space was prepared and ready, the complex, difficult, but also fun process of installing the instrument was undertaken. Once again, numerous parishioners participated in the various tasks needed to complete this work. Finally, after many months of effort, the first music from the organ was heard in September, 2016. The organ was formally dedicated on January 29, 2017 with an accompanying "concert", followed by an explanation of how a pipe organ works and an "organ crawl" tour.